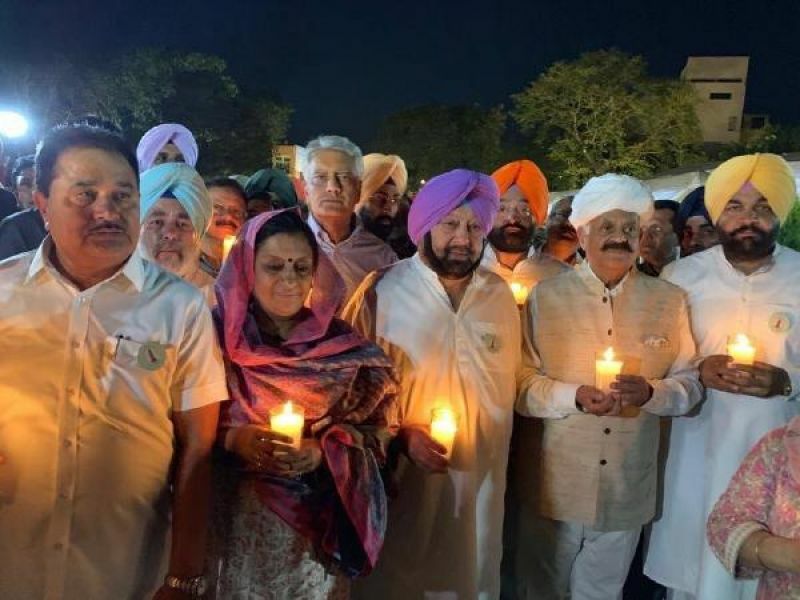 AMRITSAR, APRIL 13: Congress President Rahul Gandhi and Punjab Chief Minister Amarinder Singh on Saturday led the people in paying heartfelt tributes to the martyrs of the Jallianwala Wala Bagh massacre, the centenary of which is being observed today. The two leaders laid floral wreaths at the historic Jallianwala Bagh National Memorial here as a mark of respect for those who sacrificed their lives in service of the nation exactly hundred years ago, on March 13, 1919, in one of the worst bloodbaths in India’s pre-independence history. Joining thousands of people from all walks of life who had gathered at the historic monument to pay their respects to the martyrs, Rahul and Captain Amarinder stood in silent as they offered prayers and remembered the sacrifices of those who led the nation to its independence. “The cost of freedom must never ever be forgotten. We salute the people of India who gave everything they had for it. Jai Hind,” the Congress President later wrote in the visitor's book at the memorial, which stands tall as a symbol of the nationalism that continues to live in every Indian’s heart. It was a somber and emotional moment for the people, many of whom could be seen wiping tears as they saluted the courage of those immortal bravehearts, with the national anthem playing in the background. AICC Punjab Incharge Asha Kumari, president PPCC Sunil Jakhar, Cabinet Ministers Navjot Singh Sidhu, Sukhbinder Singh Sarkaria, and Sukhjinder Singh Randhawa were among those who Rahul Gandhi, Capt Amarinder Singh Pay Floral Tributes.